Sorry Christian and Tommy, but this is one of the examples of that no matter how good you can play guitar, it's not always a guarantee that the album you make also automatically comes out good. High ambitions for their music, their second album, and the course set on the right target, sure. But, but, but somehow it lacks all the essential final touch that makes the music interesting. They are inspired by Europe and it shows already on the title song Man With A Mission, pop metal just like Europe did so greatly, but with Golden Resurrection it is not on the same good level. Identity In Christ have a few good moments, but too often falls into the boring trap where you want to stop listening. Finally Free gives some fine elements of symphonic and melodic metal where the inspiration from Royal Hunt is evident. Generation Of The Brave finally highs the standards of the album with powerful Christian metal where there are some spirit present in the song. Standing On The Rock gets better and better, best song on the CD, melodic and right in the eye. Metal Opus 1 C almost makes you angry, standard classical violins, attempt to make a new classical hit, but the song is not elegant at all, so instead of making history you end up with reality messy in your hands. The End Of The World is here to serve as a tribute to Gary Moore, and this song they handle well and with their own spirit to the music. Disappointing album, and to add to the sad impression there are several repeats of God who is the captain. It's ok to mention it in one song, but to repeat it in other songs does not sound professional. Golden Resurrection is the new project from Christian Liljegren (Divine Fire, Audiovision and Narnia) and Tommy Johansson (ReinXeed) in which they display their penchant for melodic, neoclassical power metal. They have recruited Olof Andersson (Audiovision) on keyboards, Rickard Gustaffson (Pantokrator) on drums and Stefan Käck on bass. This is a fast album on the whole. 37 minutes of flat out power metal with impressive technical playing from Johansson. Not that I expected anything else from the ReinXeed axeman as I know full well just how good he is at combining heavy yet melodic playing with intricate solos. The keyboards are subtle and not overdone leaving the album purely guitar driven and heavy enough to cause some serious whiplash! Of course a power metal album can live or die by it singers and I'm pleased to announce that Christian Liljegren has an absolute beast of a voice! High, clear and soaring are just some of the words I would use to describe this powerful sound that will lift your spirit with each word sung. The one thing that may put off some metal fans is that this is a heavily Christian album, similar to such bands as Stryper, with songs such as Proud To Wear The Holy Cross and Gods Grand Hotel leaving no doubt as to the themes of Glory To My King. Those metalheads who are open-minded will enjoy an exceptional listening experience. Those who think metal is only about death and darkness will be missing out on something grand! 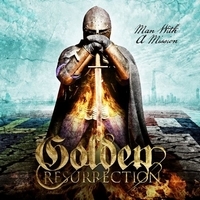 Golden Resurrection have crafted an absolutely phenomenal album that fans of melodic metal will rate extremely highly. 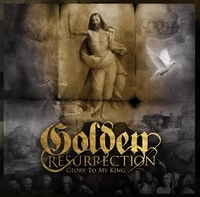 Fans of Stratovarius, Luca Turilli, Concerto Moon etc should check out Glory To My King!